the more good things will come into your life." What happens when we are in a state of Gratitude? First of all, when we feel grateful it is impossible at the same time to feel negative emotions, so in ‘the now’ where we are feeling grateful, we are focusing our energy on the positive aspects of our lives. And what we focus on we get more of! Secondly, when we manage to feel truly grateful - even for experiences that at first were not easy - we can learn from the situation and we can grow in our learning process. Thirdly, feeling grateful enables you to let go of resistance in your life. It makes you re-align yourself with the Universal power and remember that it is actually great to be here. We are here to learn and without the lessons we would not grow and develop. 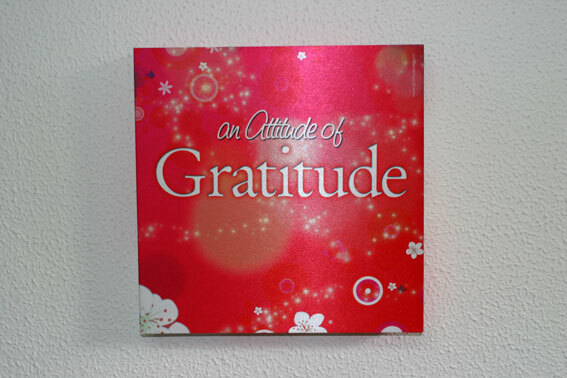 By surrounding yourself with the products of Gratitude Art and integrating them into your life, the products will help remind you to be in a state of Gratitude. Just by looking at the product, it could be a mug, a canvas, a magnet or any of the products, you will re-align yourself and focus on being grateful. What we focus on in our life will grow, so by keeping your focus on what you love and appreciate in your life, instead of the things you do not want, you create more of the "good stuff". It is as simple as that.